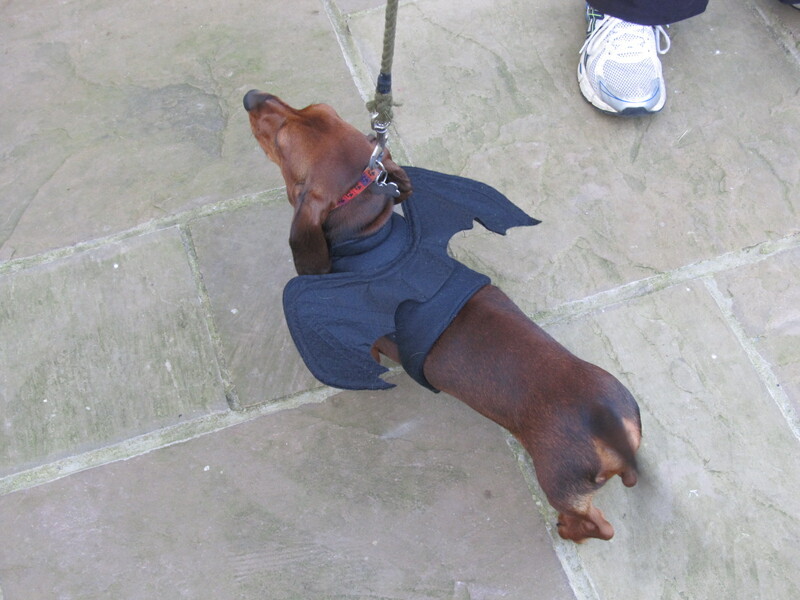 Nicholas – seen here in his fabulous bat-suit – is ready for Hallowe’en, the first he has enjoyed with all of us, bearing in mind that he didn’t come to live here until the end of last November, when he was eight weeks old. Everything is new and exciting for him but, for the rest of us, the seasons and their celebrations, secular and even religious, can be dulled by familiarity. On Hallowe’en itself, for example, we older boys know that the fun and barking must begin as soon as dusk falls, when the very youngest members of our community start calling in their ghostly make-up and masks, their adult minders waiting for them at the end of the drive while they tuck into the sweets doled out at the front door. 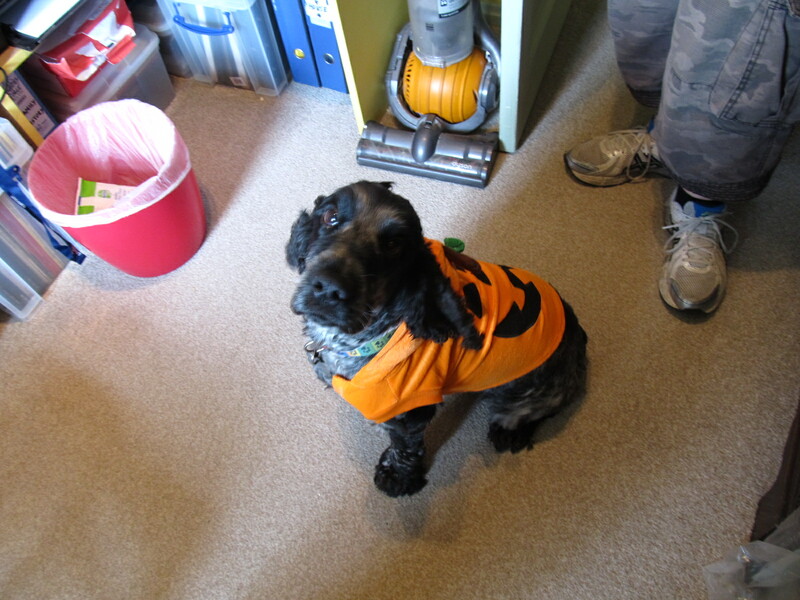 I even have a pumpkin suit in which to greet them! But there is more to this extraordinary time of the year than fun; the time when we indulge these tiny terrors with individual packets of Haribo and spooky lighting. Our young neighbours’ innocent enjoyment of this one night of raiding stands as a kind of ghostly parody of the Viking visitors who centuries ago used to disturb the Northumbrian villagers along this coast on dark nights, bringing real havoc, destruction and fear. So these days when our shores are calm, the seas clear of longboats, and Lindisfarne is at peace, we reach into the collective spiritual memory, where paganism overlaps with the rational, when in truth we cannot escape the fact that all the time the days are shortening, the light diminishing and we are losing our ability to see the difference between what is and what is not. For however happily we trot along in our regenerated rational world, fingertips from another one constantly reach out to touch us. Only this morning a black cat appeared out of the corner of the eye in one of the bedrooms being cleaned across the road – something we as a family have no problem understanding: in our previous home, everyone was used to the friendly cat which brushed against us in the kitchen; its one-time home remained its home, for ever, and she was happy to share it with Jeoffry. And as for the footsteps on the gravel . . . Well, more of that another time. This Saturday, on Hallowe’en itself, the film of Macbeth we saw them making last year on the beach at Bamburgh comes to Seahouses. Well hear lots of ordinary, honest, everyday creatures, domestic and wild, traduced in the Weird Sisters’ revolting and unnatural rhymes – dogs, bats, toads, owls – as the world turns upside-down in Macbeth’s murderous wake. Shakespeare’s imagination will pull down the veil between two worlds in a vision of self-destruction far worse than any modern horror film could devise. Banquo and King Duncan, of course, will remark upon the martins nesting high on the castle wall. And we simple, innocent creatures who make the beach our playground will reflect on how they will return. For we remember how they took down the ugly scaffold once Michael Fassbender had ridden away, leaving the ramparts – and the time – free. Exciting times, then, not routine at all, once you ponder on them, Pip. Now where is my pumpkin suit?